Download This Article By Clicking Here Now! 1. Pain is the messenger not the problem. 2. 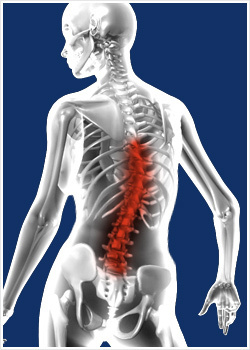 Low back pain occurs when force on the back exceeds its capacity to maintain required body position. The major external force acting on the body is gravity. It is fair to say that the major cause of low back pain is the deterioration of our relationship to gravity. Let’s get more specific. First, we need to understand how the low back works. The low back actually has two parts. The lower part is called the pelvis. The pelvis is the place where the legs meet the spine. It consists of three bones and their associated muscles, nerves and ligaments. Two of the bone are mirror images of each other and have a complex shape which includes the deep hollow which, along with the top of the thigh bone, forms the hip joint. The third bone of the pelvis is called the sacrum. The sacrum is positioned like an upside down triangle. This allows it to do two important things. First, it acts as the keystone of the arch made up of your legs and pelvis. Second, because its tip is pointing down, there is a flat surface pointing up. On this upward facing flat surface the entire upper part of the body finds support. The sacrum is the stable base that we need to have free use of our arms and head. The structure that rests on and rises from the sacral base is the spine. The spine is divided into three regions. The lowest is called the lumbar spine. This is the second part of your low back. It transmits the stability of the pelvic arch and sacral base while adding a new element – flexibility. Flexibility in the low back allows bending and twisting. The lumbar spine consists of five bones (called ‘vertebrae’) and the muscles, ligaments and nerves that enable those bones to move. Between each bone there is a thick but flexible wad of cartilage called an intervertebral disc. These discs not only provide elasticity between the lumbar vertebrae, they also act as cushions to absorb shock when your body impacts the ground when you walk, run or jump. This flexibility is an asset but it also makes us susceptible to injury and pain. You can find out more by reading my next blog. Or you can find out first hand by making an appointment to see me. Mention this blog and your examination (not treatment) is free.